9 Best Home Remedies for Tooth Pain: Dentist will Miss You ! Home » Beauty Tips » 9 Best Home Remedies for Tooth Pain: Dentist will Miss You ! Home Remedies for Tooth Pain: Currently, tooth pain is a common condition that dentists see in their workplace. Actually, Tooth pain mostly occur for consuming a large volume of processed foods regularly. The bothering thing is that you will not be able to trace the schedule of tooth pain. It can happen anytime. Sometimes going to the dentist may not be your ultimate solution. Luckily there are some natural home remedies for tooth pain that really work. A dentist may not inform you because they probably miss you as a regular patient. These remedies for a toothache works well, or even completely cure a tooth pain. If your problem becomes serious, go to a professional dentist. Read More: Ways to Stop Tooth Decay: Read How Sugar Makes Cavity in Your Mouth Like a Silent Killer! Dull motions, like chewing hard foods. There are many symptoms of tooth pain like aching, continuous pain, or pain that may feel you giving pressure to the tooth. Other tooth pain symptoms consist of fever, swelling nearby the tooth or a headache. 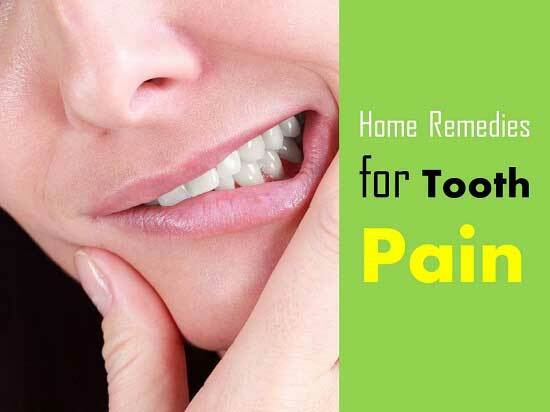 Here we will share 9 best home remedies for tooth pain that you can do at home. Using rock or sea salt can easily treat your tooth pain. Salt water works well for increasing blood flow to the affected part. Put 1 teaspoon of rock or sea salt into a cup of warm water and mix properly. Then swish your mouth for 15 seconds and spit out. Do this at least 3 times a day. Cloves are rich in eugenol compound that provides an antiseptic and anesthetic effects on teeth. Currently, dentists are applied cloves to fight against germs during teeth extractions, fillings or root canals. Apply clove oil on the painful part until the pain leaves. To do this, you can drop 1 or 2 drops of clove essential oil (don’t use in excess amount, as it can be deadly) on teeth. On the other hand, you can make a mixture (1/4 cup of water and 2-3 drops of clove oil) and swish your mouth 2-3 times a day. Tea tree oil has natural antiseptic and antibacterial effects on tooth pain. To utilize tea tree oil, take 1 or 2 drops of tea tree oil in a cotton ball and keep it on the affected part of teeth. On the other hand, you can add some drops of tea tree oil into a glass of warm water. Gargle and rinse it out. This method is very cheap and may be available in your medicine box. Hydrogen peroxide fight against infection and swelling that occur for a toothache. Mix 3 ml of hydrogen peroxide into 1-liter warm water. Then swish your mouth for 10 seconds and spit out. Do this at least 2 times a day. Oregano oil is one of the powerful antibacterial and antibiotics essential oils. Its anti-inflammatory effects can help you to relieve pain rapidly. Mix an equal quantity oregano oil and olive oil in a cup. Rub gently using a cotton ball over the affected tooth part and keep for some minutes. Turmeric is one more outstanding anti-inflammatory herb, and also great for tooth pain removal. It helps to relieve pain because of containing its high antibacterial and antiseptic effects. Make a solution with mixing 1 teaspoon of turmeric paste or powder and some distilled water, apply them to the affected part on teeth, keep it for 30 minutes and then rinse out using warm water. Peppermint contains menthol, which is an excellent compound to relieve tooth pain. This herb has anti-bacterial and anti-inflammatory effects that make it effective remedial for fighting against bacterial infections and pain. Apple cider vinegar contains anti-inflammatory and antibacterial effects on a toothache. Its acidic nature helps to kill a toothache caused bacteria. But confirm using unpasteurized Apple cider vinegar. Soak a cotton ball in apple cider vinegar and use it on your affected tooth part directly. You can also mix equal quantity of water and apple cider vinegar together, then swish with this solution for 2 times a day. Take 1 cup of water and 1 tsp. of peppermint tea together. Leave it for minimum 20 minutes. Sip them, but confirm to swish into the mouth for sometimes. On the other hand, put 2-3 drops of peppermint oil into a ½ cup of water and then swish into the mouth for 3-4 times a day.